Our training ended around 4pm yesterday. So after leaving our bags back to the hotel, we set off to make the most of the remaining daylight for the day. 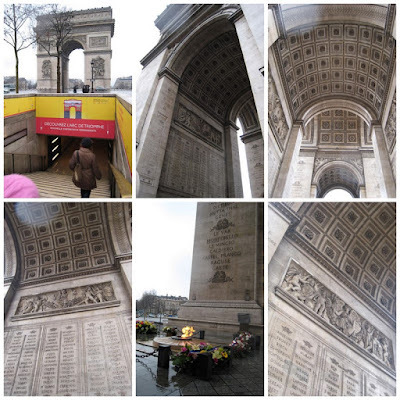 We walked from our hotel at Rue Le Peletier to the Arc de Tromphe in the centre of the Place Charles de Gaulle which is about 3.2km away. It took us approximately 40 minutes to get there in the drizzle. I was so worried that my passport would get wet as my jacket already did. Thank goodness it is still in good shape. 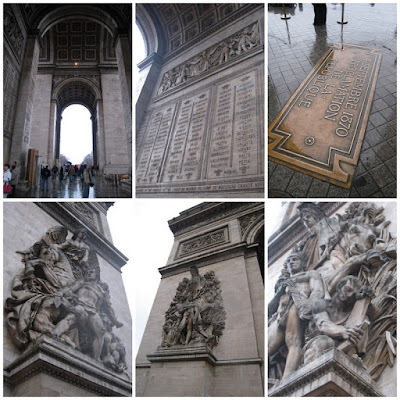 Arc de Triomphe in Paris is a monument to honor those who fought for France, particularly during the Napoleanic war. On the walls of the arc, there are the inscripted names of generals and wars fought. 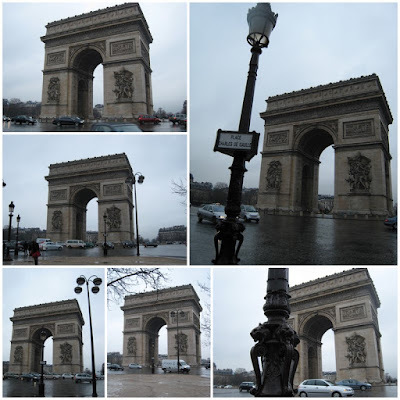 It is the world's largest triumphal arc. There is the tomb of the Unknown Soldier underneath the arc. Its eternal flame commemorates the dead of the two world wars, and is rekindled every evening at 6:30.